Aids Orphans Rising: Anna Nicole Smith and St. Lucy Filippini, could they possibly have anything in common? Read on to learn more! A CHH is formed every 14 seconds..i.e. Aids orphans of the same family trying to make it alone. This blog will try to show their plight and some real ways you might help them. Anna Nicole Smith and St. Lucy Filippini, could they possibly have anything in common? Read on to learn more! One can only have deep feelings of sorrow for the highly-publicized death of this poor girl. The loss of her life started long ago, but could her tragedy have been avoided? Today is the anniversary of the death of St. Lucy Filippini, March 25th 1732! Could she have helped Anna Nicole? What could St. Lucy ever have in common with Anna Nicole Smith? St. Lucy spent her life helping young girls and women at risk. She would lead them ever so gently to Jesus that they would turn to a life of virtue. When one is close to Jesus one cannot stray far from Him. Had Anna Nicole gone to school with St. Lucy as her teacher how her life would be so different! Both she and her son would still be alive today! And her poor infant daughter would have a loving mother. Reminded of today’s Gospel-who of us could condemn her? Jesus asks those of us without sin to cast the first stone. Funny, not one stone was tossed! So, is there an Anna Nicole Smith in your life? Do you know some young girl headed down the wrong road? How can you help her? Pray for her, let her know she is loved for the goodness within her, not for her external beauty. St. Lucy would bring the girls close to Jesus through prayer and meditation. Perhaps you can teach someone how to pray, simply, even just one Hail Mary. Ask her to say it with you slowly, and encourage her to say it every day. The Blessed Mother will lead her on the right path. 275 years after her life on earth we continue the works of St. Lucy in our schools for women and young girls throughout the world. We ask you to pray for the Sisters that they might gently lead these young souls to God. 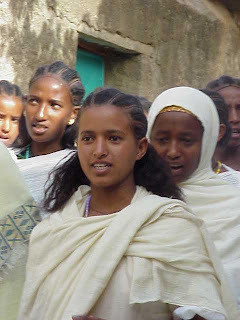 These young girls are students at St. Lucy School in Adigrat, Ethiopia. They’ve lost their parents form AIDS and must provide for themselves and their siblings. We ask you to pray especially for these girls, abandoned and desperately needing help, to provide for the smaller children. Pray that we may find them before they turn to a life of enduring sadness and tragedy. Thank you for all of your help. May you have a good final week of Lent. Am so edified by your great commitment! moved to persevere more. Your blog serves as a reminder of the labor God has given to us, here in our country ( Philippines) and in other parts of the world. For more than 300 years we have been helping to educate women and children. At this time our biggest challenge is making sure the children are cared for before we can teach them!